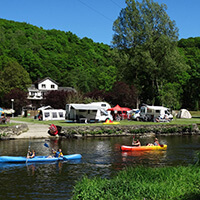 Camping pitches, ideal for mobile homes, tents, caravans … This campsite is located in the beautiful Ourthe Valley, 3 km from the city center of La Roche-en-Ardennes. It offers calm and serenity, with its locations on the river or under the trees. Families will find their happiness quickly, in the heart of the “Pearl of the Bulge”. The shallow river water commits to swimming or the pleasures of kayaking and trout fishing! The campsite is surrounded by the Ardennes forest with its beautiful marked walks, a real joy for walkers, mountain bikers or other riders. 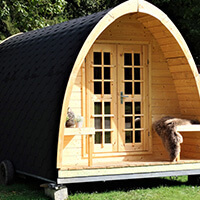 Several locations are available for mobile homes, stabilized terrain and adapted amenities. 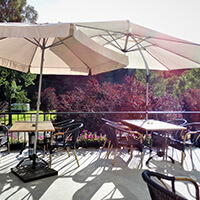 A camping holiday in the Ardennes, camping is located in La Roche en Ardenne, beautiful campsite in Belgium.